Leverage the latest advances in machine translation to capitalize on efficient translation processes. Memsource supports 25+ machine translation engines, ranging from the most advanced neural machine translation technology to customized machine translation engines trained with your data. Memsource can meet the widest range of machine translation needs. Memsource supports over 25 machine translation engines, ranging from the most advanced neural machine translation technology to customized machine translation engines acutely trained with your data. Memsource can meet the widest range of machine translation needs. Memsource’s patented technology capable of identifying high quality machine translation allows you to capitalize on machine translation savings. 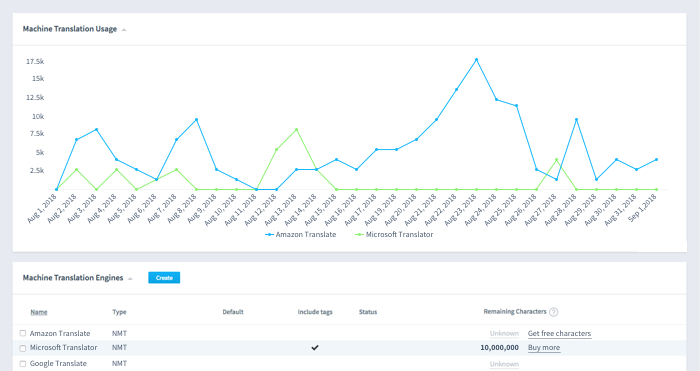 When used in combination with AI-powered Non-translatables, users can enjoy two boosts to typical machine translation savings.